One of the most striking features within the showroom is the current storefront which has been recently updated. There are 12,000 stainless wires covering the length of the front window (creaming a wonderful spectacle) which is the very same number of strings that are used to make a Steinway piano. 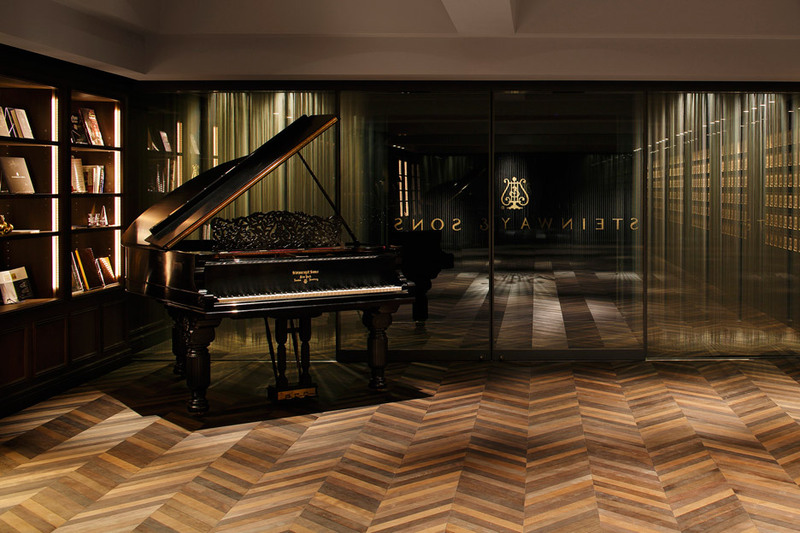 There are areas of the showroom where the floor and the walls are made from the same woods that are used in the production of Steinway pianos; beech, bubinga, walnut, maple, and mahogany. The result of this shop come showroom is stunning, and if ever visiting Tokyo, is surely worth a visit. You don’t have to go to Tokyo to get a Steinway at home! If you have always fantasised about having your very own Steinway, but can’t afford the hefty price tag that they come with, you should consider a Kawai piano. As a company, Kawai work in conjunction with Steinway, making some parts for them and helping them in the production process of their pianos. In any Kawai piano you will be faced with a sound of outstanding quality. When it comes to digital pianos and electric pianos, Kawai have certainly cornered the market, making (arguably) the best, most affordable electronic pianos available. You can have your very own Kawai digital piano at home for under £500 and with a selection of piano sounds, it is certainly a deal worth looking at! If you can stretch your budget then have a look at the Kawai KDP90 which has previously been described as the King of digital pianos and looks like a substantial piece of furniture which is sure to compliment any home setting!